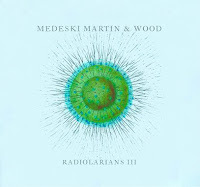 Medeski Martin & Wood will release the third installment of The Radiolarians Series. Radiolarians III, which was recorded in December 2008, is scheduled to be released on August 4. Check out "Undone" from the record HERE. The three albums from The Radiolarians Series will be compiled into a limited edition boxed set with in-depth packaging, vinyl as well as bonus audio and video content. You can look for that package later this year around holiday season time.